This is surely the ultimate mathematical riddle and most probably the first. It is about the life of Diophantus, the father of algebra, who lived in the second century. It comes from a fifth century Greek anthology of number games and puzzles created by Metrodorus. One of the problems (sometimes called his epitaph) is the riddle you see above. 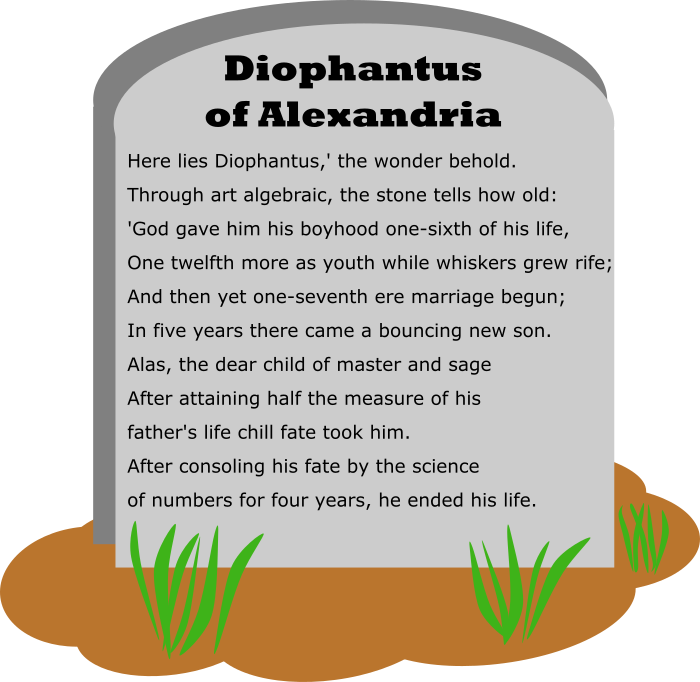 The riddle can be written as an equation where \(x\) is the age Diophantus died. The solution to this and other Transum puzzles, exercises and activities are available when you are signed in to your Transum subscription account. If you do not yet have an account and you are a teacher or parent you can apply for one here.